AFTER WHAT FEELS like seven years of winter, there will be some good weather this bank holiday weekend. 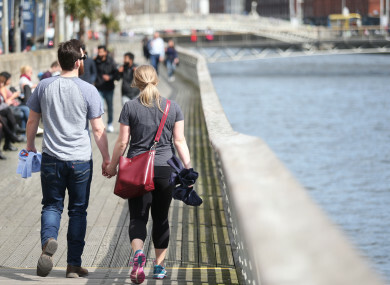 Met Éireann says that while today will start with some fog and drizzle, top temperatures will hit 20 degrees in places. Tomorrow will start off cloudy in many areas, with patchy drizzle, mist and fog in places, but it will soon brighten up with spells of warm sunshine developing. It will be humid with maximum temperatures ranging from 14 to 20 degrees, with the warmest weather in the midlands and east. Sunday will be similar, but cooler near coasts. Inland, temperatures will hit 21 degrees, with most places staying dry. For Monday’s bank holiday, it will be dry and sunny with temperatures topping 20 degrees. Those nice conditions will more or less finish on Monday, as unsettled weather makes its way across the country. Email “It's a bank holiday and the weather is going to be really nice - for a change”. Feedback on “It's a bank holiday and the weather is going to be really nice - for a change”.